These are apps or links we use often; that have helped us in one way or another! Some of them are affiliate links (so we might receive a small commission, at no cost to you), but we will only share things that we have tried and actually think are worthwhile. Hope you find these useful! VIPKID- I teach English online to sweet little kiddos in China! Babe is actually in the middle of his application process as well. You do need a degree to teach, but it does not have to be in education. For more tips and details you can check out this blog post. Uber- I drove Uber for about 6 months and I actually loved it! My schedule changed and I haven't had the time to jump back in, but it's a great option for working on your own schedule! Fancy Hands VA- I occasionally still do Virtual Assistant tasks for Fancy Hands. It's a great way to pocket some extra income. Tasks vary and you pick what you want to do. The pay averages out to about $15/hr. Talent Gigs- Don't let the word TALENT deter you! These are agencies set up to hire day helpers at events like beer festivals, sporting events or car shows. You know those people that run the raffle booth or give you a koozie when you spin a wheel?! They are most likely hired through a talent agency. Babe and I are signed up with a few different ones including Pepper Talent. You check the schedule to see what gigs there are, depending on where in the world you happen to be, and then apply. You can make around $25/hr (sometimes more, sometimes less). It's not consistent work, but it can be a lot of fun! We can't wait to work our first beer or wine festival! AppCoiner- This is a company that will pay you to test apps. I sing up and did a couple, but haven't in a while. If you enjoy trying out new apps it could be a fun way to make a little side money, but it's not going to be a replacement income. My phone just got way too full (still rocking that outdated iOs)!! Groupon- I feel like Groupon has started to fall by the wayside, but we still use it all the time for planning cheap date nights in new places! One of our favorite Groupon's recently was for a haunted history tour in Savannah, Georgia. TripAdvisor- We LOVE using TripAdvisor for finding off-the-beaten-path spots and reading up on adventures in different cities! 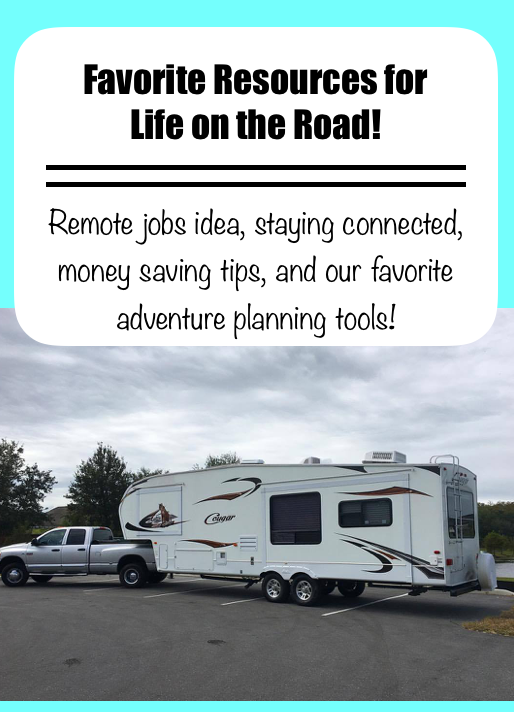 Travel Guides- We have two favorite guides that we use pretty regularly! They were gifts from my sister and we have them dog-eared and always ready to point us in a new direction. Reader's Digest Off The Beaten Path is our go to for unique experiences in each state and we love this guide for anything National Park related! Ibotta- I LOVE Ibotta! Best money making tip: Use it for wine! The wine and beer Ibotta rebates are great! We will scan Ibotta, then compare it to prices at the local wine store and use it to try new wines for A LOT less! The other day, between sale price in the store and my Ibotta cash back, my bottle of wine was only $3!! So far I have earned over $200 cash using Ibotta! We will be adding to this list as we get more fully immersed in road life, so be sure to check back! I'd love to know more about Fancy Hands. Almost every blogging community I am in talks about either getting a VA or using one, but not a lot on becoming one! I think this is even the first time in a while I have seen a website to look into other than just using google, so thanks for that! Also you guys are super adorable in that photo and I am a readaholic, too! Kind of slow start this year for me, as I'm only on my 6th book! !